In an opportune interview with New York artist Sara Rahbar, between travelling and a state of rest, she discusses her practice, politics and principled interests with Rajesh Punj. What becomes apparent in Sara Rahbar’s company, besides her obliging beauty, is that she is quite anxious to try to explain the cause and effect of everything that leads us to the here and now; and as a consequence her initial honesty proves both appealing and incredibly profound. Rahbar herself says that she ‘always longs to just be able to sit and stay for a while and feel like (she) can trust and let go’. In conversation what emerges feels more akin to the candid exchanges of a confessional, as I record our conversation. Assured of a bright future, highly regarded both in the US and the Middle East, she still remains tormented by her past, in ways both exhaustive and productive; describing her work as a ‘cathartic’ act, and going further to suggest, ‘I’m afraid that things are falling apart around me and by sewing and welding things together, they will somehow stay together.’ If everything is in danger of falling apart, if the seams of the wider world, of all objects and feelings are prone to come undone, then art for Rahbar has been the transformative power to draw everything back together. In no way ‘decorative’, Rahbar’s works are her own resourceful alchemy; reassuring the artist of her own wellbeing, whilst appeasing the past and equally managing and maintaining her own personal future. Yet as much as you can engage with her status as an artist, you can as equally become troubled by her general unease with everything. 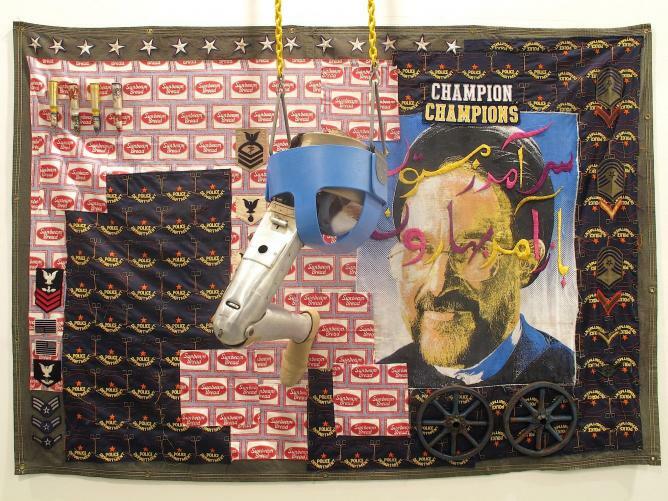 Given such grievances the ‘Flags’ series, her signature works, delivers Sara Rahbar with a recurring point of reference, that she has returned to some fifty-two times in eight years. 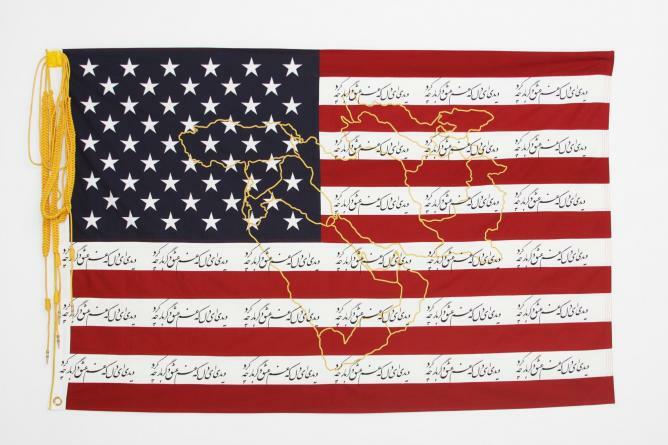 Rahbar’s affection for the American flag allowed the artist to look at it equally for its aesthetic qualities as for its potent symbolic, which was the reason the series never became a visual confrontation between two flags, America and Iran, but more the ‘arresting development’ of one flag and its metamorphosing into these varying visual tapestries. But her deserved angst is better explained when reading that Rahbar and her family fled Iran on foot after the 1979 Islamic revolution, during a period in the county’s history when the Ayatollah Khomeini was sworn into power at the cost of ruling Shah. No more than four years old, Rahbar arrived in America, the country she held responsible for the downfall of Iran in the first place, where she had to assimilate to a different kind of ideology that at the time was as confusing it was accommodating. Likened to a ‘tornado’, Rahbar felt an incredible sense of misfortune and injustice occurred at the hands of political meddling, at the time . For all the politics it is impossible not to be drawn in by Rahbar’s intensity, her lucid tone and exhaustive approach to her making new works; and like a dervish whirling with greater momentum, Rahbar appears to have moments of incredible intensity that are punctured by periods of collecting objects, sourcing new ideas and acting as the impassioned protagonist she wishes herself to be. 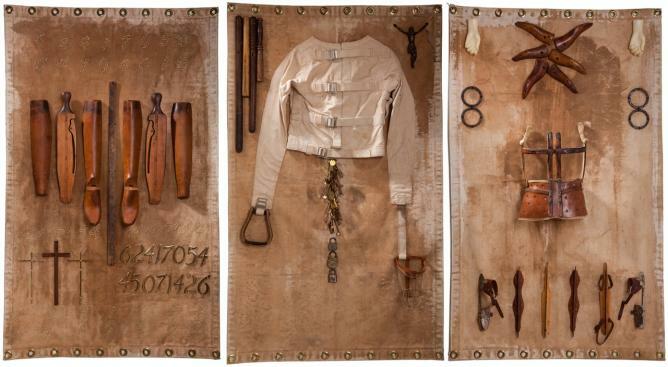 As an artist and philosopher, memory, history and the fundamental tapestry of life are as integral to Rahbar’s work as the modern detritus she collects as source material. To the end as she eloquently puts it, ‘it’s always challenging for me to talk about my work, I like to make things, I want and need to collect objects and piece them together in a way that brings me peace of mind, that completes something for and makes me feel like everything is right with the world and with me. It’s not something that I can dissect, explain or understand clearly, it’s just something that I do and can’t seem to stop doing.’ As resolute discussing politics, people, and her principled interests, Rahbar is a rare breed of artist and intellectual who wears her heart on her sleeve and speaks her ceaseless mind. Q: Upon completing at St Martins, you went from London to Tehran to work as a freelance photographer for four years. Was this your first time in Tehran or where you returning to the city? And what of your freelance role, what were you in the city to photograph? A: Sort of, I hadn’t been back for about ten years or so, so everything felt pretty new and I had quite a gigantic culture shock. I returned to figure out the direction of my life and my work. I felt like something in me was incomplete, unresolved in a way, I returned for closure, so that I could move on. I documented the 2005 presidential elections with sound and photography, it was an amazing experience. I also worked as a freelance photographer for various films and documentaries. Q: Why did you not pursue photography there on in? A: It was too flat for me; I needed more texture, more layers and more objects. Q: You were teaching and exhibiting in New York whilst working in Tehran, so were you going back and forth very regularly? And how were you at assimilating to the two cultures? A: For about five years I was living and working between the two countries. Q: Do you consider yourself more American than Iranian? A: Neither. I don’t believe in nationality. I am a human being living on the planet earth. Q: What were some of the early works you were exhibiting in 2006, 2007? Q: Before discussing your works, can you explain your artist’s statement? What do you mean by ‘falling, standing and attempting to survive it all’? A: Pain, being broken, falling and trying to put the pieces back together again and attempting to move on and to move forward. Q: Confessions of a Sinner (2011-2012); can you explain that work and how should it be viewed? A: I never have a specific way that I want people to view the work. I can’t control the way that the work is viewed and interpreted, and I wouldn’t want to. Once the work leaves my studio it’s out of my hands. Q: Two of the works, ‘Praying for Time’ (2012), and ‘You asked me to enter, then you make me crawl’ (2012), are song tiles, how significant are the titles of works to you? A: The titles are very important to me. For me it’s the completion of the piece. I get them from everywhere; music, poetry, life, advertising, political slogans, from my boyfriend and I also write my own, it just depends on the piece and what works best. 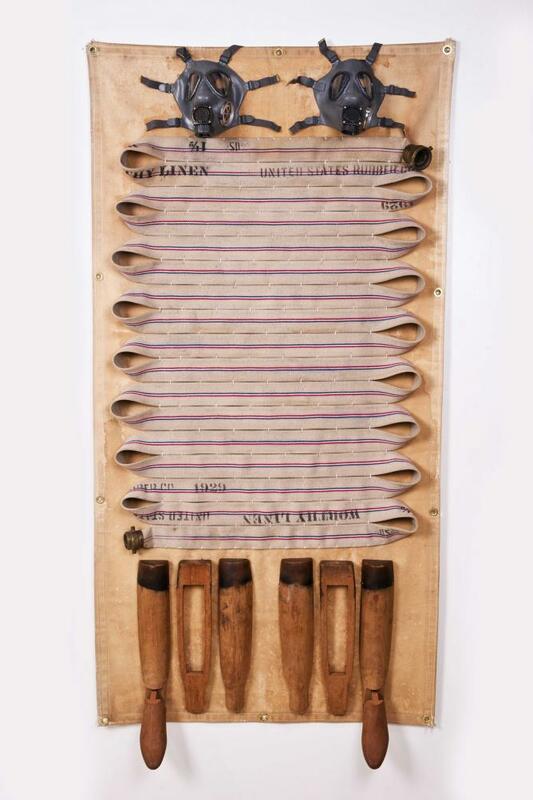 Q: Love Letters (2008 – 2010), is another body of works that hang like banners, can you explain them? And also your interest in hanging works, including your Flags series? A: I used to be a painter and when I started working with textiles I felt like I was still painting; it was still about colour and composition, and I guess I treated the work like a painting, like a tapestry. I never think about these things. It all happens very organically and instinctively for me. My studio is so chaotic and packed to the rim with stuff that I long for that moment when I can see the piece hanging on a clean white wall with empty space all around it. Q: You have a substantial body of works with the War series (2009 – 2013); can you explain the choice of motifs and objects that are applied to the material? Are you referencing a specific war or the general condition of conflict? How significant is the politics intertwined into these works for you? A: My work is not about any specific country or war, it’s more about pain, violence and the human condition. My process is very instinctual: I collect objects and materials and piece them together in a way that makes sense to me, and I don’t always know why I make certain pieces, I just go with my gut and I don’t question my instincts. And I’m not specifically trying to talk about social and political issues; I talk about my life. In the end it’s my autobiography. My work takes on issues that I have tackled and witnessed throughout my life. Q: And is there something of a ‘readymade’ quality to the body of works? A: I like to work with objects that are used and beat up, objects that have lived. Collecting and finding odd and interesting objects and materials is a huge and very important part of my process. Q: Flags (2005 – 2013) are your signature works, how did you arrive at this series using the national flag as your unstretched canvas? A: I have this deep obsession with piecing and holding things together. Maybe I’m afraid that things are falling apart around me and by sewing and welding things together, they will somehow stay together. It’s very therapeutic for me, I have to do it and I can’t stop doing it. It’s my lifeline, my sanity. I am constantly in a state of questioning, dissecting and attempting to understand myself, and all that I see taking shape and form around me. I have this obsession with flags and ideas of nationality and this need for belonging, to something, to someone or to somewhere. I have always just wanted to feel a feeling of being safe, a feeling of security. I have been running since I was a child, to and away from people, circumstances and life in general. And I have always longed to just be able to sit and stay for a while and feel like I can trust and let go. I have never felt like that and that longing shows up in my work, staring me right in the eyes. Longing, belonging, loving and being-loved. When I work on a series its feels like a love affair, and they very naturally go on, and on, and on, until they just don’t anymore, because there is nowhere left to go. I reach a point of completion, a point of salvation and closure, it’s instinctual, like love. Q: In 1961 in his essay ‘Modernist Painting’, American art historian Clement Greenburg considers ‘the limitations of painting, as the application of paint upon a flat surface.’ Are you considering your own set of limitations when using a flag as your starting point? A: I never think of limitations when I begin on a body of work, I just work. And when I begin to feel limited, I move on to a new body of work. Q: Using and reusing such a nationalistic symbol, have you ever been accused of intentionally desecrating the flag? Q: Of fifty-two flag works, you have two Iranian flags, why is that? A: There are 52 flags all together in the Flags series. And In the midst of the series I decided very organically to work with the Iranian flag, while I was living and working between Tehran and New York. But after working with the Iranian flag a few times I decided that I didn’t want to continue, as the emotional attachment that I had towards the American flag wasn’t as strong for me with the Iranian flag, I felt a disconnect, so I stopped and continued the series with American flags. Q: And is it significant for you to turn the flag over? So the back becomes the front and the stars move from the left hand side to the right? A: It’s a matter of composition and the moment for me. I go with my instincts. I am not attached to either, I just go with what works. But I have to admit, I do love the idea of placing things backwards and upside down. Q: There is something impossible to describe with each of the flags that effectively binds them together, a point of reference or sense of place; do you see that? A: Yes I can see that now, but I never thought about it before. I always saw them as individual works, floating in space on their own, completely separate entities, each piece a world of its own. Q: Are you advocating something political in your flag works or are they purely ‘decorative’? A: I have no intention of making anything decorative, ever. Q: Regarding your photo-works can you explain your Love Arrived & How Red series? Is ‘I lay in the darkness of an anonymous grave, stripped of you, I remain’ a biographical work? A: It was like a performance, I was resolving something. All of my photo series were shot in Tehran, and they were always more like performances rather than photographs, a lot of it comes from my subconscious. Q: There is something quite overwhelming when looking at your 2009 installation, ‘You burned my house down, then offered me shelter from the rain’, in the same way one is hypnotised by a coffin of a fallen solider is draped in the American flag, do you feel such heightened parallels? A: Yes, that installation is based on my personal relationship with America. Q: Finally can I ask what you are reading right now? And where your current influences come from? A: Sylvia Plath, always, Sylvia Plath. Life, totally random, unexpected and unexplainable.